First, for those who are anti-car-alarmists: not to worry - I plan to have the shock sensor sensitivity cranked way down - the primary motivation behind this install is to facilitate remote door locks and ignition cutout. Vehicle entry alarm only goes off if someone opens a door or the boot. I abhor morons who have their vehicles set to screech at all hours when a semi trailer drives by two blocks away. I've been meaning to install a remote door lock in my XJS for some time. Stock, it already has electric door locks (solenoids), which are triggered when you manually lock or unlock the door with a key - the far side lock is actuated when the switch in the nearside one is turned with the key. For Christmas, 1999, my in-laws presented me with a car security system, something which had been on my list of things to get for the Jaguar. Actually, my priority was to get remote door locking, which happens to be a feature of most car alarms. The Flashing LED was on my list of projects as well (see my Trip Computer project), and I'll probably still wire the alarm into the Trip Computer logic (the computer could log "events", as well as multiplex the secondary function button - one press vs. two presses, or press and hold, etc). The unit is an Audiovox Prestige Platinum APS-150. 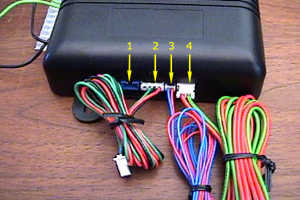 It comes with the alarm control module (an approx 8 x 9.5 x 3 cm box), to which the included 11-wire harness connects, a 45cm black antenna wire hangs off of, and two loops (a green loop and a black loop with insulated connectors on it, as well as four connectors, a shock sensor module, and the siren. The kit also contained a grounding plunger and bracket (for trunk entry switch), a multitone siren, and two keychain remotes (with batteries installed already). I first examined the installation instructions to see what sort of systems I'd have to cut into and to what extent I'd have to make modifications (something I'm not wont to do). I'm endeavouring to install this alarm - siren, logic module, LED, shock sensor, and valet switch, all without drilling any holes, and with a nominal amount of wiring alterations. Thus far, only one wire is cut, and one hole has needed to be drilled. Everything else has been through tap connectors in the wiring. The black loop (the one with the insulated connectors on it) controls whether the system is passive armed (closed), in which case it automatically arms when you shut off the ignition and exit the vehicle, or active armed (open), in which case you must activate the alarm with the remote. 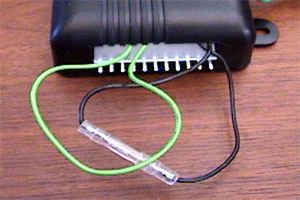 The green loop (wire, no connector on it), enables voltage sense if closed (if the cabin light comes on, or any other thing causes voltage to drop, it will trigger the alarm - this could be used to bypass the necessity to wire in the door and trunk switches -- but an after-shutdown automatic engine fan could inadvertently trigger the alarm. If the wire is cut (open circuit), the system relies on hardwired triggers only. The documentation isn't clear as to whether the unit will trigger if the voltage RISES after arming (though I'd assume it probably wouldn't, since cabin lights - and automatic headlamps might turn OFF after arming). Certain optional modifications of the cooling circuit could trigger the alarm. Even the trip computer project might (although it is my thought to use the secondary function to turn on the trip computer logic and perform functions). I opened up the main alarm box and stuffed the two loops inside the case, getting them out of the way. Both loops are CLOSED - affording maximum security (such as it is). Several features are RF programmable (using the remote in conjunction with the valet switch and ignition): 1 SECOND or 3.5 second door locks, auto lock on or OFF, and auto unlock on or OFF, and PASSIVE or active door locks. I'll address these settings after I complete the install. The control module must be mounted someplace. I'd prefer a location that doesn't clutter the wiring, but remains central to the wiring needs, thus someplace in the passenger side footwell is a likely candidate (see install notes below), and it also needs to be able to route the antenna wire "as high as possible" (as per the install instructions). The shock sensor must also be mounted someplace -- the instructions advise screwing (or even wiretying) it to the firewall (there is a sensitivity adjustment procedure after install is complete). I elected to mount it to a 1/8" aluminum plate, which is the basis for mouting this as well as the control module and valet switch. Lastly (for mounting hardware), the valet switch must be installed somewhere where the driver can access it easily enough to manipulate for system config - OTOH, I don't expect to need to do a lot of reconfig of the unit after it is initially configured, so if it is a two-person job to configure because the switch is out of reach, then that is fine by me. The valet switch also disables the alarm if turned off AFTER the ignition has been turned on (even though initially, you can't START the car when the alarm is triggered). This makes cramming that bugger into an inconvenient location a little more of a priority. After running over the install instructions, I took the valet switch and desoldered the two wires, slipped the appropriate sized shrink tubing over them, and resoldered the wires - I'm not fond of exposed conductors. My XJS has a later model cigarette lighter facia, with which I'd replaced the original (because the retaining clips had been broken on the original). The later model unit (which fits in XJS' with the veneered shifter surround) has an integral LED - for use by alarms, but which has been unconnected on mine. I'll need to open the slope to solder wires to the LED and route them up along the console and over to the alarm -- I AM NOT keen on drilling a hole anywhere to mount the included LED. Additionally, I wish to contact the manufacturer to arrange purchase of spares for the LED connector on the alarm control box. RED - constant +V (at the fuse panel, coming from the INPUT side of the interior lights). This is both the alarm power and the sensor for voltage change (which is why having it near the lamp fuse makes the most sense). It'll be tapping into a BROWN wire there. WHITE - parking lamp relay - this is for flashing the parking lamps on activation and deactivation. It'll pulse the lamp relay briefly. However, according to fig 7.1 in my XJS electrical guide, there is NO parking lamp relay (seems kind of dumb), and to top it off, the right and left sides are wired independently (RED/SLATE = Left, RED/ORANGE = Right). Terminals two and three of the lighting swich control the lamps. The wire of of the alarm is is rated for 15A max, so the relay could be foregone, since the circuits use 2Ax2 for front, and 3Ax2 for rear (total: 10A). The trick then is to install a relay, with constant voltage, ground, input from alarm, and output to BOTH parking lamp leads, but with diodes inline (to limit current between the two lamp circuits). WHITE/BLACK - +V to siren (GND for siren runs to frame ground). I'll need to drill a hole (or find existing route point to send the wire through the firewall for the siren. Since this is one wire, it shouldn't be overly difficult. If I have to tap a new hole, be sure to properly insulate it with a grommet, and consider oversizing it just enough to allow for some additional wires (for other sensor projects). PURPLE - N/C (FORD TYPE +V door trigger). Not used on the XJS, where the door switches are grounding type. As such, but to preserve the wiring for the harness, I REMOVED the wire and contact from the harness connector, and stored it away for some other time. BROWN - Driver door switch (GM GND type). Normally, one might run this to the door pillar switch on the driver side (simple switch that contacts to ground when the door is opened). Instead, I should tap P1 of the delay unit - Purple/White, which further centralizes the wiring (this delay unit is in the passenger footwell). The trigger will still operate even if the delay unit is on or off, or nonfunctional, since ground will be present at P1 of the socket when either door is open. (See p11.1 of electrical guide). As it happens, my XJS already has a tap located on P1, effected by a repair of the passenger side door switch which was nonop when I purchased the car - and in which I could NOT locate the original wiring for (it simply wasn't there). YELLOW - +V from ignition (this is the ignition sense). MUST be off when ignition is off, and on when in run or crank. Fig 4.1 of electrical guide indicates that I should tap into a WHITE/PINK lead, which comes from ignition terminal #5 - runs to relays for windows, radio, and seat. Note well that from the point at which it branches out into the different relays, there is an indication that there is an UNUSED connector there. DARK BLUE - Delayed 300mA pulsed Output (Channel 2). Pulses to ground via an independant RF channel from the keychain transmitter. This is a transistorized, low current output and should only be used to drive an external relay coil. 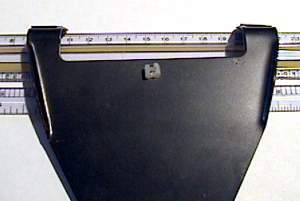 No Connection (LATER: trigger for secondary function). For the time being, I removed this wire from the harness as well - whenever I get around to enabling the secondary function, I'll reconnect the wire to the harness. Note that in all likelyhood, this will act as an input to the revised trip computer - a LONG (2 sec?) 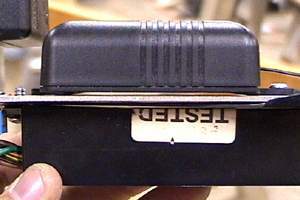 depress would trigger a short timer relay to power up the trip computer module (which would ignore long pulses if already powered up), then sense a series of shorter additional presses for a morse-code like control function. Things that could be multiplexed: Windows UP/DOWN. SHOULD probably have full-throw detection microswitches in either door to detect that the window is all the way up, or all the way down (which would be a good mod to have with even the regular window circuit). Siren enable/disable (trigger a two-throw nonmomentary relay) Trunk release (would of course require the trunk to be wired for one - this should involve a low current signal line from the dash to the trunk area, and a +V in the trunk (remember, the battery is there) plus ground for the relay as well as the trunk solenoid). The +V should be inline fused with a fuse of an appropriate value. Remote start (hmm, must wonder how to modify the ignition switch to accomodate such a mod, but I guess it could be done with some relays). BLACK - GROUND - wire directly to a convenient ground point, if not on the fuse panel frame, then at the firewall itself. ORANGE - 300 mA Ground Ouput when Armed. N/C starter disable (optional relay required). This wire is provided to control the starter cut relay. Connect the orange wire to terminal 86 of the relay. Connect relay terminal 85 to an ignition wire in the vehicle that is live when the key is in the ON and CRANK positions, and off when the key is in the off position (this is where the YELLOW wire from the alarm should be connected). Cut the low current starter solenoid wire in the vehicle, and connect one side of the cut wire to relay terminal 87A. Connect the other side of the cut wire to relay terminal 30. This is a normally closed starter cut arrangement, and when power is removed from the security system, the starter disable feature will not operate, allowing the vehicle to start normally. It is not recommended that the ORANGE wire interrupt anything but the starting circuit of the vehicle - since inadvertently pressing the alarm enable switch would kill the ignition. Arguably though, if the relay were energized when the ECU is running, then once you've STARTED the engine, it would continue to run, but when you've shut it off, the ECU will power down and when the alarm is armed, the relay would prevent the ECU from being powered back up. Will need to consider how to wire this properly given that the ECU relay would provide +V rather than GND. 2 relays would accomplish this: one which switches between active ground (when ECU is on, and the relay is energized), and alarm ground (when ECU is off, relay in neutral state). Problem here is that the switching time of the relay could cause the ECU to power down again - sending the relay into a rapid buzzing back and forth. See p2.1 of the electrical guide. It would be possible to inline this on the ORANGE/BLACK wire between the inertia switch and the EFI main relay, thus effecting a complete ignition cutout. Alternatley, a similar configuration parallel to the neutral switch on the gearshift could be employed (BLACK/GREEN wire - there SHOULD be connector points on that wire), providing an alternate path to ground to cut out the starter relay. Ultimatley, the inertia switch is able to cut out more systems and be a bit more difficult to bypass than the starter relay inhibit. DARK GREEN - Instant Trigger Zone 2 - should be connected to bonnet/boot grounding switches, if so equipped. The kit includes a switch and installation bracket, but on the XJS, this is unneccessary, since the boot lamp switch would serve this purpose just fine (boot lamp switch is a grounding switch when the boot is open). There is a side benefit to wiring it to the existing boot lamp switch (or having the voltage sense enabled, though that isn't adviseable with an electric fan scheme wired to start up after shutdown): if the boot lamp switch fails to shut off the boot lamps, the alarm will go off (or refuse to activate), signifying that the boot lamp switch isn't properly engaged. This particular alarm flashes the LED in a particular sequence to indicate what "zone" caused it to trip, so you'd know that the boot switch was triggered. 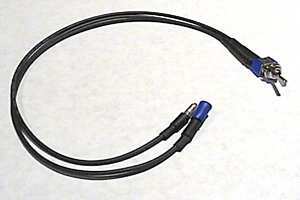 (1) 2 pin blue connector: Valet mode switch. Routes to grey and black wires to the valet switch. I shall produce a mounting plate on which I can mount the switch under the dash (most likely on the passenger side), using existing screw holes. If mounted through the underscuttle, will have the plate bent such that the switch isn't visible from the underside. Note that eventually, this switch could also be bypassed with the trip computer modification - the trip computer would act as the valet switch, which further increases security since the trip computer could require a code to be entered to turn it on and off (as well as "detune" the engine for valet mode). (2) 4 pin white connector: (3 wires: red+black+green) to shock sensor. (3) 2 pin white connector: dash mounted LED. The kit comes with a blue + red wire with LED attached. I cut the wire a few inches from the TINY connector at the control module end, and soldered it to a longer pair of wires which I routed under the console to bullet plugs for the LED on my lighter socket - no drilling necessary to mount the LED on later model XJS' with veneered console slope. (4) 2 pin white connector (22 AWG Red + Green wires): Door lock outputs. These wires will provide either a pulsed ground output to the factory door lock control relay, or a pulsed +12V output to the factory door lock control relay. In either case, the maximum current draw through these outputs must not exceed 300 mA. 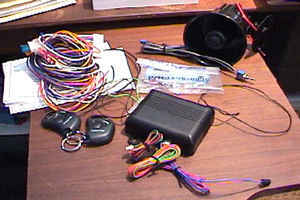 The kit provides for several configurations of door lock schemes: 3 wire ground switched, 3 wire positive switched (this is what the XJS is), 4 wire polarity reversal and 5 wire alternating 12 volt, the latter two requiring the AS 9159 Door Lock interface or equivalent 30A automotive relays. Referring to p21.1 of the electrical guide presents us with a diagram of the XJS door locks. The lock relay is on the driver side, and the unlock relay is on the passenger side. Here, we can see that each relay has a W2 terminal, to which +V is applied - the GND is always present. By tapping the GREEN wire from the alarm to the ORANGE/WHITE wire (to the LOCK RELAY), we can actuate the lock relay. Likewise, we would tap the RED wire from the alarm to the ORANGE/BLUE wire (to the UNLOCK RELAY). 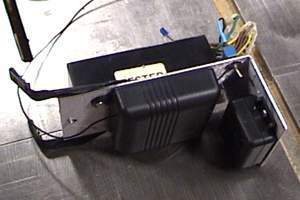 The lock relay wires are conveniently accessible in the kick panel on the passenger side. Oddly, the manual isn't clear about HOW to change the door lock modes. Upon speaking with a tech rep from the manufacturer, they say that the alarm simply pulses to ground and then +V - there is no inherent configuration. Also, diode protection is unneccessary (according to the mfr.). Off to the electronics supply store to pick up some 0.25" spade splice crimps (useful buggers for allowing you to splice into a line using a spade connector, so you can REMOVE the connection later: also means that ALL of the connectors on the alarm harness will have 0.25" insulated spades soldered on, and I shall crimp on the appropriate taps on the various lines that will be tapped. These used to be available at Radio Shack, but seem to be absent from their current catalogue. For the boot lamp switch, I should remove the original, rough up and solder down the spacers (or perhaps install a grommet, if the insulation doesn't pose a problem), and solder on a heavy duty spade or bullet connector, to which accessories can be connected (rather than having the wires soldered directly to the switch). I can then run a lead from there forward (over the wheel well and up to the speaker area behind the driver seat?) to meet up with the DARK GREEN wire for Trigger Zone 2. Not a biggie if initially this isn't installed (because routing that wire is going to be a pita). I'll probably end up soldering (and shrink tubing) - or use an insulated spade connector to produce an extension for the antenna wire, thereby allowing me to route it up higher as per the installation instructions. In any event, the very tip will be insulated with shrink tube so as to not expose a potential conductor. It is interesting to note that the box contained a form for ordering additional 2-button transmitters -- at a cost of US$65 apiece. I can't imagine that the original alarm kit cost more than US$120, and that included TWO transmitters. Called their Customer Service department requesting the LED connector, and was informed that they don't have it available as a separate part - but they did ship out a replacement LED wire (complete with LED). Their main number also has access to a Faxback function: 2 4405 (pause) 1 1 117 # # (your fax number) (pause) 1 # Will get you the XJS install guide (although their rep indicated things different than how I determined the install should progress). A tech rep said the starter cutoff is probably a switched contact - not a relay-driven device, and so armed or unarmed, it shouldn't be consuming power. The Quick Disconnect Tap-In Connectors (available through Radioshack as stock #64-3092 and UPC # 040293122751 for about US$3.00 for a bubble package of 6) are very handy: they splice the line (no cutting necessary), then you can tap in with a 0.25" spade type connector. They're also removable (though you'd want to do something about the insulation - a dab of liquid electrical tape would do the job). Unfortunatley, the Radio Shack website doesn't recognize this as a currently stocked part. Radio Shack no longer carries this part (lame, it was a brand-new offering when I picked it up barely 8 months ago). Fortunatley, part in hand, I located it at another electronics store. The crimp is apparently made by 3M (there is a 952 designation moulded into the insulator). WS-3 (3 pieces) T splice 18-14 AWG (blue) WS-2 (3 pieces) T splice 22-18 AWG (crimson red) WS-4 (2 pieces) T splice 12 AWG (yellow) Distrubuted by: Caltronics Circuit Inc. 15421 Red Hill Avenue Suite A Tustin, CA 92780 No need to strip (in fact, DO NOT strip) -- just crimp it on, and take the wire you're tapping into the line and crimp/solder a 0.25" spade connector on it (I use a fully insulated type - fits very snug and not a bit of metal is exposed). 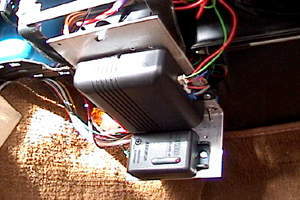 Boot lamp switch: located near the hinge on the left side of the boot. Behind the carpet trim cover in that corner, you'll find two bullet mates: one with two Black/Pink wires in (right and left boot lamp assemblies), one Black wire out (to switch), and the other with Black wire in (ground) and Black wire out (to switch). Disconnect the black wires leading to the switch, then unscrew the switch (two phillips head metal screws - no machine nuts to lose). If you're OEM, you'll still have the rubber bootie under the switch, which you'll need to remove. Keep track of all the parts for the reinstall. I removed mine because I wanted to recheck the soldered contacts and deal with some spacers (an earlier repair to solve a boot lamp always being on). Note that because the switch has a ground input, the switch itself doesn't have to have a good ground to the frame - if you painted the switch surface plate such that the screws didn't provide a solid ground, it wouldn't affect anything -- so if you need to install a spacer gasket underneath the switch to address a failure of the switch to fully close when the boot is shut, you don't have to worry about using a conductive material. I simply soldered a bullet connector to the green wire which I was using for for the alarm "zone 2" ground trigger, and plugged this into the connector where the two Black/Pink wires come in (the connector has a vacant bullet socket on the output side). DO NOT plug it into the other connector which has Black in and Black out -- that is constant ground (which is what the switch is closing to when open). Subsequently, I also picked up a Radio Shack #275-634B mini flat lever switch. SPST with 6A contacts. This switch is almost identical to the switch used for the valet switch on the alarm itself. To this, I've soldered leads with bullet connectors - one female, one male, so that I can patch it inline to the boot lamp switch without making it a permanent mod. I located an existing hole (one of several) in the metal sheet below the boot lamp switch, passed the switch through, screwed down the locknut, and plugged the harness in between the ground side of the boot lamp switch. Replaced the trim carpeting panel, and reached behind it to flick the switch -- lights out. The switch now allows me to turn off the boot lamps when I'm in and out of the boot for an extended period of time, and also allow me to to take precision current measurements (which I do with the meter inline to the battery, giving me measurements down to the fractions of a milliamp) without fumbling for a clamp with which to keep the boot switch depressed. I realize that I could simply remove the appropriate fuse from the main fuse panel, but that has the undesireable effect of shutting off another circuit, which may be cause of the problem I'm tracking at the time. Should paranoia arise, I can leave the switch thrown, and sleep easy with the knowledge that the boot lamps cannot possibly be coming on. Yet another non-permanent, non-scarring modification to the cat. I could optionally move the switch to between the boot lamps (black+pink) and the boot switch ground output if I wanted to allow the security system to still sense the switch being closed. For my purposes, I'm comfortable with it the way I've wired it. While routing the green wire for the boot lamp switch (bullet on the switch side, insulated female 0.25" spade on the opposite -- to mate to a male insulated spade like I was placing on all the other alarm wires), I also routed a spare wire for future use for a relay trigger for a boot release mechanism. I have no solid plans for this right now, but at least the wire is routed, with a few feet to spare for locating it just right. One need only route the relay trigger wire -- the battery is in the boot, so there is direct access to a +V source for the solenoid current switched by the relay, and grounding is available within the boot (or if the relay switch is actuated by a remote ground, +V is available within the boot, same difference). An appropriately sized grommet should be used if a hole must be drilled through the firewall. Also, you should have a quantity of wireties onhand to facilitate routing the wires and bundling them to existing wiring or anchor points. I expect to cut wires to proper length at the alarm harness, although you may or may not wish to retain the full length of the wires and tie them into a loop. I also soldered an approx 1 metre length of 18 AWG wire, heatshrinked the solder joint as well as the tip. This served to extend the antenna length, and should allow me to feed it up the passenger door channel, behind the trim adjacent to the front window. The one drawback to soldering this is that if I need to remove the alarm for some reason, I'll either have to un-route the wire, or cut and resolder it. Later, I hope to fit a solenoid to the boot latch/lock to facilitate remote unlocking of the boot. I know the '82 - '85 XJ6 has these, and will need to examine one to see whether it could be adapted to the XJS. Comments on the jag-lovers archives indicate that these are wired for LOCK only and are wired to the door locks, althouth the solenoid does have a contact for an UNLOCK lead. Later XJS' also had boot releases, but according to quotes (of dealers) on the Jag-Lovers list, they're not capable of being retrofitted to the earlier models. I've routed a spare low-current wire to the boot for a solenoid-triggering relay in preparation for this project. My interest is really in having a boot release - a temporary unlock action coupled with a release of the latch. A spring may need to be fitted to allow the boot lid to pop up automatically. Also in the archives, I found that someone had elected to mount the control module strapped to an A/C vent, and wiretied the shock sensor to the steering column. I'm not keen on putting the control module near any climate vents, as the humidity/temperature variations could shorten its life. However, mounting the shock sensor to the steering column seems like a bright idea worth investigating. In the name of not drilling new holes, I fashioned a mounting bracket from 1/8" aluminum for the siren and positioned that behind the grille (cone facing mostly downwards, perpendicular to the front of the auto, so as to not collect as much road crud, or retain moisture in the cone), which utilizes three existing holes on the LHD passenger side (opposite from the auxilliary coil). Similarily, the alarm control module is mounted to a bracket which it is my intent to have anchored through existing screw holes - quite probably near the cruise ECU. Well, the alarm is MOSTLY in (the difficult wire routing is dealt with). Last Wednesday, I spent much time trying to route the wires to the boot through the previously identified grommet, finally succeeding, after having wasted a bunch of time repairing the wire with the resistor mentioned in a thread on Jag-Lovers (which quickly spiraled into a discussion about speaker dynamics), because the wire was VERY difficult to get to as the trim panel wasn't about to come out without major disassembly. At the end of the day, I still had not routed the wires from the engine compartment through the firewall - I could pass them through into the fender with the other bundles, and fish them out near the door, but that still wasn't inside the cabin. Thursday, I got up and decided I'd have to resort to drilling one hole to complete this install -- into the plate to which the windshield washer reservoir mounts. Below this is a vacuum cannister (one of the two vaccum lines entering the plate goes to that, the other, as well as a line out of the cannister, pass through a channel out the side of the compartment, towards the opposite side of the vehicle), and below that, is a piece of noise dampening material (that something-like-tar-impregnated fibreboard), which has a hole which leads to right behind the very top of the passenger side carpet. A couple of minutes and a 3/8" metal cutting drill bit later, an additional hole was in the upper left corner of the cover plate (positioned such that wires would pass through without bumping into either the cannister or the rim around the panel). Slip the appropriate grommet around one of the wires (I'd already fitted a 0.25" spade connector to it earlier for testing), then fitted it into the hole, and stuffed the other wire through, then routed them through the hole below the cannister (no need for a grommet there - not a metal plat, or even very rigid). Now those wires are accessible in the passenger footwell. The alarm actuates the door locks (the prime motivator for installing the alarm). On my '88, the trigger wires are accessible behind the side panel below the dash on the passenger side (adjacent to the door - I'll take a pic). Tapped the Orange/White (lock) and Orange/Blue (unlock) wires with some taps to which to connect the wire pair from the alarm control. A positive pulse on the appropriate wire activates the appropriate relay, locking or unlocking as appropriate. Right now, this works, but the driver door doesn't lock well (hasn't locked from the passenger keylock either) - but it does unlock fine. I'll have to rebuild a solenoid at some point and then go and deal with replacing the one in there (it DOES activate when the remote is triggered, just doesn't seem to do so with much oomph). Sunday, I removed the passenger side ashtray ("change holder") to pop off the cigarette lighter facia (the one with the integral LED) and ran a wire pair up from the passenger footwell area and through the console to the cigarette lighter facia (the one with the integral LED, to which I had soldered and heatshrink insulated a pair of bullet recepticles (colour coded even). The Black wire is ground, and the pink/stripe wire is +V on the LED. I'm a bit disappointed that the LED isn't a bit brighter from an angle - visibility looking down at the led is good, but from the sides, it isn't so great -- had they used an LED with the diode element mounted higher, it would have looked better. I'm thinking of seeing what is involved with pulling the led from the housing and replacing it with a different type. Bummer also that it isn't a dual polarity LED - they could have had a flashing RED LED for armed and a green LED for disarmed (assuming of course that the alarm output polarized signals -- the one I'm installing doesn't - there's a rapid flash and a slow flash). I also produced a harness for the parking lamp flasher (for the alarm activate/deactivate confirmation flash). The XJS has separate circuits for the left and right parking lamps, so I have to tap two wires, and provide diode protection between them (well, if they weren't intended to be separate circuits, it hardy seems likely that they'd have originally wired it as such). This isn't tapped in just yet, but the harness has a Y splice, with each leg having a 6A (400A 1/2 cycle) rectifier diode inline. 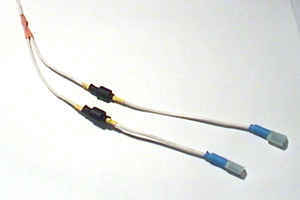 Both diodes and the splice point are encapsulated in heatshrink tubing. 16AWG wire. I still need to tap an ignition lead (hot on run/start), and wire in the relays for the ignition cutout. The wires from the boot, while in the cabin, are still in one of the rear storage compartments - I've got to route them up under the carpet to the footwell, though that won't be a big job (been there, done that with the CD Changer - though I probably should run a new pair of speaker wires while I'm doing this, to faciltate a future speaker upgrade). Lastly, I've got to re-cut the mounting bracket and position the control module somewhere appropriate - where I'd originally considered placing it doesn't have enough clearance for the lower dash fascia. Monday, I ran out and picked up two SPST NO 30A automotive relays at the local Radio Shack. #275-226, US$5.99 apiece. These have a mounting tab on them (integral to the plastic moulding). Interestingly, the packaging identifies that they're made in England (gaak, is Radio Shack sourcing parts from Lucas? ), and a small stamp on the bottom of the relay says "MADE IN E.E.C.". These were a LOT cheaper than the other local alternative, which overprices components and carried only a Siemens 40A relay in this type of packaging, but that had a metal mouting bracket. I wasn't interested in paying US$14 apiece though. SPST (Single Pole, Single Throw), NO (Normally Open), 12V coil voltate, 6V pull-in voltage, 3.6V Drop-Out Voltage. SPST Contacts rated 30A at 12VDC. Coil Resistance is 66 Ohms. Nominal Current is 160mA (approx 1/2 of what the alarm circuit will drive). Basically, we tie 86 to ignition-switched +V, 85 to the alarm ground output, 30/51 to the EFI Main Switching Relay, and 87 to the Inertia Switch. For the parallel relay, 85 is tied to ground, 30/51 runs to the EFI Main Switching Relay, 87 to the inertia switch, and 86 runs to +V from the EFI main switching relay (the switched output of the EFI main switching relay). It would seem that - at least in my Cabriolet, all the signal wires to and from the boot route through a pair of grommeted holes in a baffle on the LHD passenger side (forward of the EFI ECU). I presume that if I remove the speaker enclosure panel in the rear of the cabin on that side, that it may be possible to reach in and stuff a couple of wires through - with a loop tied to them, so that I may use a bent wire hanger (or other sophisticated tool) to hook the loop from the boot and pull it back (unless the wire can be pushed through easily enough to reach it without necessitating a hook). The LHD driver side has a baffle and no holes (and it far too inaccessible to easily drill and properly grommet anyway). While routing the alarm wire and the 18 AWG spare for the boot release relay, I also ran an 8-conductor Helix Hitemp wire (this is CAT-5 network wire, but is stranded conductor, giving it excellent flexibility), which may someday prove useful for other low-current projects which may be routed to/from the boot. I've already mounted a CD changer (in one of the Cabrio storage compartments), and have no desire to install a subwoofer in the boot. A useful characteristic of wiring the boot lamp switch to the alarm: if the boot lamp for some reason fails to shut off, the alarm won't allow me to arm it (i.e. I'll know the boot lamp is on), and if it should "pop on" for some reason (though I've reconditioned the switch and this shouldn't be a problem), the alarm would be triggered - a nuisance, but considerably less so than being greeted by a flat battery on a gloomy morning. I'm actually thinking that wiring a small LED (with appropriate resistor) inline to the boot trigger lead, under the dash, would be a useful indicator that the boot switch is fully closed - the LED would be on whenever the boot is - or thinks it is - open, eliminating any future need to wire an inline test bulb to determine if the boot lamps are properly being shut off when the boot is closed. 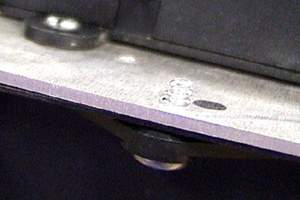 For instance, the siren itself will be mounted behind the grille (near the aux coil), screwed to a mouting plate which in turn is bolted down through one of the existing holes on that platform. 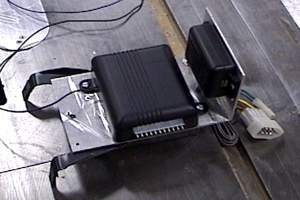 The boot switch is easily tapped with a .183" bullet plug into the 4-way connector which the switch connects to the lamps with (right/left/switch/alarm). The alarm will use an LED made available through a late model cigarette lighter facia (for those of us with veneered ski slope consoles, this is the currently available replacement facia), and the sensor, logic module, and valet switch will all mount to an adapter plate which I hope will be able to be anchored by using a combination of existing screws and their holes (via mounting tangs). As per the ignition cutout below, I expect to have to CUT only one wire to perform the installation. This is all if my plans execute well. There is one other thing I'm pondering: the starter inhibit. This alarm has a single wire output for a starter cutout. In normal operation, the wire is rated 300 mA to ground. If the alarm is tripped (and power is applied), it interrupts the ground signal. This is intended for driving a relay on the power to the starter solenoid. Since this operates in very much the same manner as the neutral start switch, which is an input to the starter relay, it seems a natural to put a relay inline to the neutral start microswitch, and have this signal control that relay (ground would allow an ignition-switched +V to actuate the relay and allow the neutral start microswitch to close the circuit, and if the alarm was triggered, the relay would leave the circuit open - simulating an in-gear condition. There is a (minour) drawback to this simplicity: accidental activation of the alarm circuit would cause the car to operate in closed-loop mode even when in park or neutral. I don't think this would be a biggie (and might not even be noticed since you're unlikely to be doing much driving in park or neutral - certainly your driving safety is unaffected, and the screetching alarm siren would probably let you know you did something wrong). I prefer the more agressive nature of the inertia switch (in my later model, it cuts EFI, fuel pump, and starter - all in one fell swoop), which makes that circuit an even better choice (besides, for what it is worth, by cutting the fuel pump, you keep a potential theif from flooding the engine while they repeatedly attempt to start your Cat). HOWEVER - the rather brief alarm install docs advise that only the starter be inhibited. They don't go into detail as to why, but it is pretty easy to come to the conclusion that if your engine management is interfered with WHILE YOU'RE DRIVING, then an accidental activation of the alarm while the auto is running will cut the ignition - something which could have dire consequences. This could happen from the button being bumped on the keychain while in the ignition - or the spare which your wife carries in her purse gets activated while she's rummaging for makeup. If, as advised, your starter is the only thing inhibited, then the operation of an already running vehicle isn't affected by an accidental activation of the alarm (though your siren would still sound). A is the inertia switch, which merely interrupts ground when it is tripped. B is a relay spliced into that line - input is from the EFI main relay, unenergized contact is N/C, energized contact is out to (A), coil +V comes from an ignition switched source, and the coil GND comes from the alarm. This provides the initial closure of the circuit allowing the car to start normally. C is a relay in parallel with B. Switched contacts are arranged the same as the above relay, coil +V from terminal 87 of the EFI main relay (WHITE/ORANGE), coil GND directly to appropriate frame ground (such as the ground point of the inertia switch). This configuration addresses the concern that inadvertent activation of the alarm would kill the ignition - as long as the EFI is energized, the parallel circuit which it energized will complete the path through to the Inertia ground. The operation of the Inertia switch is unaltered -- if it should trip, it will work just as normal: the cat is no less safe than stock. The trick is that the relay is initially switched by the alarm circuit being grounded (disarmed state), and as a result, the EFI main relay is energized, which in turn provides power to the EFI system - permitting the car to start - AND applies the nominal power to the PARALLEL relay, inhibiting the alarm from cutting the ignition, since even if it tripped and shut off the original relay, the parallel one is still there completing the circuit. As long as the ignition is on, this circuit isn't interrupted - even if the alarm is activated. 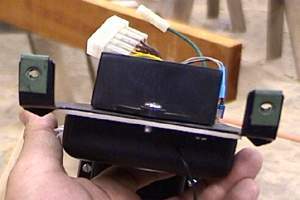 As the parallel relay is shut off with the ignition, the relay pair is reset to require the alarm to be inactive in order for the EFI to be re-energized. Inhibiting the ignition in this fashion, instead of simply cutting out the starter, keeps a would-be thief from merely bypassing the starter relay with a jumper wire (something which a thief familiar with this car will probably be prepared to do - moreso because starter cutouts are a common antitheft mechanism on all security-equipped automobiles). Since interrupting the ground circuit here causes the fuel pump to not run, and the EFI not to run, the thief cannot start the car even if they can get the starter spinning, since there is no EFI management present. Ooops. Originally, I had thought of installing one relay (B), but that had the obvious flaw of leaving the running ignition at the mercy of the alarm. The first solution I came up with was a second relay in SERIAL - switched by the same EFI main relay output, but switching the ground from the B relay to a direct ground (this whole mess still resetting to rely on the alarm grounding when ignition was shut off). Quickly, it dawned on me that depending on the characteristics of the EFI ECU, or possibly on a low battery voltage condition, the relay might flutter (the very brief switching time would in effect cut ground to the ECU, shutting it off, and therefore cut power to the relay, which in turn would switch it back to the alarm ground, which would power it back up, and repeat the process). Click-click-click-click, and not much useful work product from the ECU. I realize the switching latency might not pose a real problem in real life, but I decided that it wasn't the right approach -- the parallel method avoids switching flutter entirely, because the ground is never interrupted to the EFI system - instead, a second grounding path is created. After the install is complete, I've got to remember to check with my insurance company to see whether I qualify for any form of discount on the comprehensive policy because of the alarm and anti-theft circuit. This of course is a general reminder to anyone here with a car which has an alarm: your insurance company may allow a discount on your theft premium if you have a security system fitted - they may not, but if they do, it is worth checking, since it could save you some money. It was drizzly out today, so I didn't do much on the Jag. I prepared three wires to run from the LHD driver side over to the passenger footwell. I located the Red/Slate and Red/Orange wires at the back of the lamp switch and tapped them both. To these taps, I connected the white wire for the alarm flasher (the one prepared with the two 6A diodes shown in a picture above). I then located the White wire coming off of the ignition switch. Electrical diagrams show that this runs to the coil, which makes it an excellent choice to tap for RUN/START sensing (the coil must be energized in order to run, AND it must be energized to start). I ran a yellow wire from that tap. I also ran an orange and a blue wire (both with female 0.25" spade connectors) over to the driver outer kickpanel (adjacent to the inertia switch). These will be for connecting to the ignition cutout relays - the Orange wire connects to the alarm. The Blue wire is to tap into terminal 87 (White/Orange) coming off of the EFI Main Switching Relay, which is on the LHD driver component panel, immediatley to the left of the upper row of fuses, and positioned about the middle top of two other relays (one of which is the red Seat Relay). I about freaked as I was examining the Electrical guide (p2.1) for the location of the EFI Main Switching Relay, didn't find the component location identified there, so flipped to p3.1, which showed the EFI Main relay in the boot. I was expecting I'd have to run a wire there (or to the Feedback Inhibit Relay near the Starter Relay in the engine compartment). However, THIS IS NOT THE SAME RELAY. p4.1 shows the location of the EFI Main Switching Relay, as described in the paragraph above. Note that I checked, and when the ignition is running, THIS alarm refuses to activate, so it would seem that having the parallel relays shouldn't pose a safety risk, although I still want to have it in there so I can call it done. As for the Inertia switch, all you have to do is cut the Black wire, and place male and female 0.25" spade connectors on either connector (allowing them to be reconnected at a later date should you remove the alarm, or if a problem should arise). I connected a male to the grounded side, and a female to the inertia relay (a function of voltage potentials). Relay A (labeled "Inertia Inhibit"): Orange to 85, +V to 86 (tap an IGNITION +V), 87 to the ground wire the wire NOT connected to the Inertia switch), and 30/51 to the inertia switch. Relay B (labeled "Inertia Inhibit Bypass"): 85: to terminal 87 of Relay A, 86: Blue wire to tap on EFI Main Switching Relay, 87: to terminal 87 of Relay A, 30/51 to the inertia switch output from Relay A.
I then passed a releaseable wiretie through the screw mount holes on the relays, and wiretied them to a wire harness. Late last night I went to examine the relay harness for the EFI Main Switching Relay, as I was going to tap it, so that I could restore the Drivers' underscuttle. I discovered that the wiring to that relay was all wrong. I posted an inquiry to the XJS list, and the one response was that the relay I was looking at was probably the Load Relay. I examined the panel for the Load Relay and found that it was where it was supposed to be. This morning, on revisiting the Electrical Guide, I found that the Seat (Lumbar) Relay matched the wiring schematic for what I was holding. But that is supposed to be in the RED socket below and to the left of the EFI Main Switching Relay. Upon examining that socket, I found it to be wired for the Fog Lamp Relay, and finally, the Fog Lamp Relay was wired for the EFI Main Switching Relay. I rerouted the harness wiring to the appropriate relay bases, and installed the relays in the positions which are indicated by the diagram. Before reseating the EFI Main Switching Relay, I tapped the WHITE (terminals 30 and 86) wire and the WHITE+ORANGE (terminal 87), and connected the BLUE and YELLOW wires respectively. I can now cut the ground wire for the Inertia switch and solder on 0.25" mated spade connectors, to which I can connect the bypass relays, route the three (WHITE parking lamp, YELLOW switched ignition, and ORANGE ignition cutout) wires through the console centre and reinstall the Driver's underscuttle. I found that the alarm docs were a bit misleading on the start cutoff output (the ORANGE wire). Docs claimed that it was capable of 300mA, and was grounded when the alarm is OFF. Turns out, it is quite the opposite - grounds when the alarm is ON. So I had to run out and purchase a different relay - a normally closed relay, and which switches to an unused contact when the start inhibit is active. I cut the ground wire on the inertia switch and soldered in a pair of mated 0.25" spade connectors, then promptly discovered that the seatbelts wouldn't retract once the ignition was off. Reconnected the black wire to itself, then checked each of the Orange+Black leads, which had insulated 0.25" spade connectors at their ends going into an unidentified bundle (I suspect the diodes), Disconnected the one to the EFI Main Relay (50/50 chance it'll be the one you try first), and connected the relays inline to this. Now the seatbelts operate normally, and the ignition is COMPLETELY cut out when the alarm is active. Yesterday, a radioshack.com flyer arrived, which had a couple of components which would have been handy to have: a double relay socket #980-0125 for US$1.99 (socket & wired harness for two relays), and a 30A Single Pole, Double Throw relay #980-0122 for US$2.99. This relay is precisely what I needed for the primary ignition cutout relay (since the alarm provides a ground on ARMED, the relay needs to be NORMALLY CLOSED to complete the circuit - a double throw works fine here - you just don't use the terminal you don't want - in our case, the terminal that is closed when the relay is energized). Bummer I wanted to get the relay install done today - I paid US$12 or thereabouts for a 30A SPDT relay rather than mailordering this one. After installing the relays and wiring them in, I tested the operation (the alarm control module is sitting connected in a jumble of wires on the passenger side floor), then replaced the driver side underscuttle. 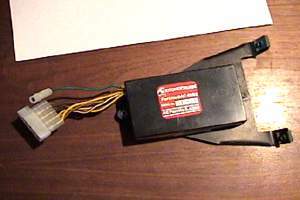 The cruise control ECU, removed from the passenger footwell (below the aux fuse panel). It is to this that I shall be mounting the alarm plate. 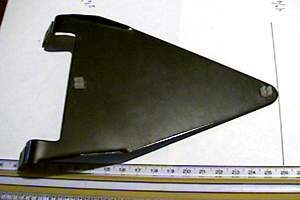 The cruise control mounting bracket, with the Cruise ECU removed. Just the right size for mounting the alarm control module. Here, I've replaced the screws and plastic snapwashers with a sheetmetal screw (with the tip ground flat), which is screwed straight into the aluminum sheet. Net result: No new holes in the kitty. All of the screws into the aluminum plate were sanded down, so there wouldn't be sharp protrusions. 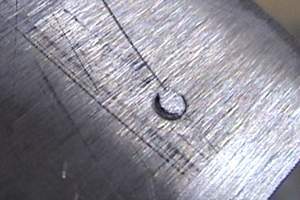 The scratches visible on the plate here and in other pictures is from running a hand file over the screw holes to deburr them. Various views of the assembly. Note though that when fitting it for installation, I determined that I had to rotate the alarm control module 90 degrees in order for the underscuttle to clear the module (see the following pic). Finally, this is the alarm, mounted in place. I routed the antenna wire (with extension) up under the dash. If I revisit the dash at some later date, I'll attempt to thread the antenna up through the forward pillar. The underscuttle is then reinserted, and the alarm is activated and adjusted (via the sensitivity adjust on the shock sensor), and options are selected by toggling the valet switch, ignition, and remote in a certain sequence. The truly retentive can opt to paint the mounting plate. I didn't use mine as a ground conductor, so I could have done this had I elected to. When done, I had drilled one hole into the cat - at the plate below the washer reservoir, for running the wires through from the passenger footwell into the engine compartment. I had cut one wire (the black ground wire on the Inertia switch), to which I soldered and insulated a mated pair of 0.25" spade connectors. On testing, I determined this wasn't the wire to affect (turning the ignition off would immediatley kill the passive seatbelts), and so connected the cutoff to the appropriate Orange+Black lead (right where it entered the diode pack, with a 0.25" spade connector -- meaning no wires need to be cut at all). Lastly, I had tapped several lines for wire, using the 3M tap-in connectors shown above: ignition, right+left parking lamps, door lock+unlock solenoids, ground side of courtesy lamp timer relay, and ignition +V and Switched +V both from the EFI Main Switching relay. I should note that it would seem as if the density of this car works against me when it comes to sensing a jolt - sound deadening insulation also reduces vibrations, and it takes a pretty deliberate thump to the door pillar to set off the vibration alarm -- rocking the bumpers don't seem to affect it (though I'd like to think that some moron performing the "park by feel" maneuver will set it off). I have yet to pull the wires from the boot up from the rear storage compartments. As I haven't yet tackled the project of engineering/installing a boot release solenoid, I don't need that wire hooked up yet, and the boot lamp switch, which I'll eventually actually connect, doesn't NEED to be as long as the boot lamps come on because the alarm is set up for voltage sensing -- it'll detect the boot being opened because it'll sense the (small) voltage drop that ocurrs when the lamps come on.